Be on the lookout: Google announced a major change to the appearance of in-app advertisements to its popular and powerful Google Maps feature, making them look more like regular search results. 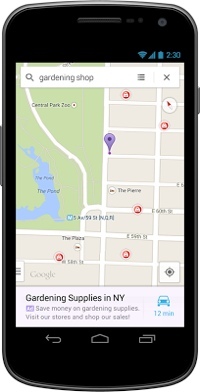 “Relevant ads on the Google Maps app can now appear at the bottom of the screen after a user performs a search. They include a title, ad text, and a link to get directions. Users can tap or swipe upward to see more information,” explains a post on the Google Inside AdWords blog. Search for “gas station,” for example, and Google might first show an advertisement for a station 3 miles away before it shows you a result closer to where you are. As you can see in Google's sample image at the right, these ads appear with a purplish background to distinguish them from other, non-paid search results. Google makes the bulk of its money though advertising, so the move isn’t especially surprising. It's just means you'll need to pay a little bit closer attention to your searches. With Google, the most prominent returns often aren't the unpaid organic search results. They’re listings from companies that have paid to be there.